For Immediate Release: Posted On 7/28/2015 By Industrial Magnetics, Inc.
Industrial Magnetics, Inc.(IMI) has published a new, 40 page, full color catalog titled "Magnets for Holding, Lifting, Fixturing, Fabrication, Welding and More". The catalog includes over 70 new part numbers for increasing the speed, efficiency & safety of material handling operations involving metal. New product offerings include magnetic holders for welding torches, air tools, cups & spray guns, adhesive backed cup magnets and Max-Attach™ Polymagnets® for high-performance holding. 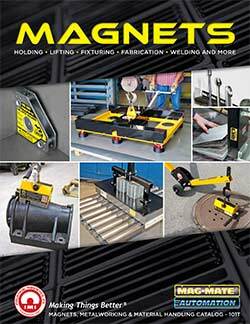 The catalog also includes updates on IMI’s full line of lifting magnets, manhole cover lifts, welding magnets, magnetic sheet fanners and Transporters®. The catalog is available to download from the "media" page of the company’s website(registration required), or a hard copy can be requested by calling 888.582.0822.